Samuel Buck and Nathaniel Buck. 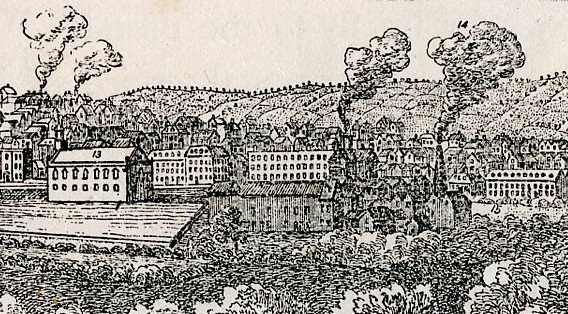 East prospect of Birmingham, 1753. In December 2018, we received a deposit of material from the Fighting for our Heritage project, which was run from the Pat Benson Boxing Academy (MS 4948, Acc 2018/067). 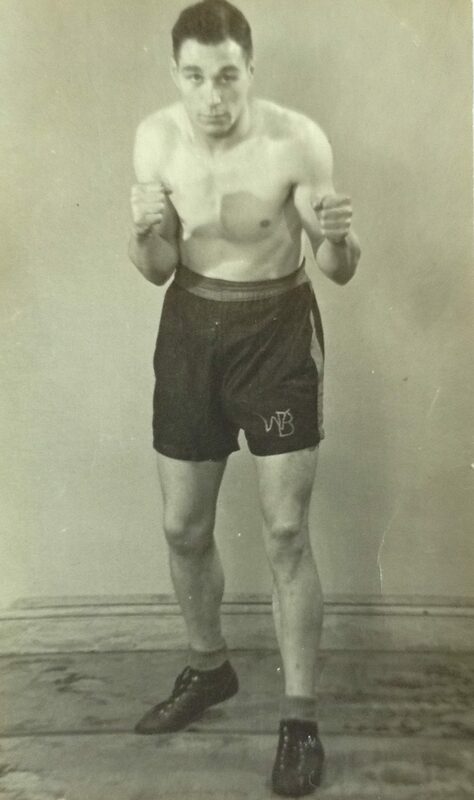 The project was funded by the National Lottery to document the history of amateur boxing in Birmingham and the collection includes some wonderful photographs of boxers in the 1940s and 1950s, along with promotional material and programmes. The Pat Benson Boxing Academy has had many changes of name and locations over the years. 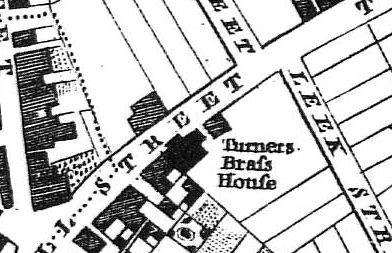 Its origins date back to 1931 when it was founded by Stephen Hayden from Kilkenny as the Irish Foresters and operated from The Hen and Chickens, Custard House and Sydenham pubs. Stephen built the foundation of a community club that would retain its Irish roots and identity and over the decades, the club has grown and ‘nurtured talent from the black and minority ethnic communities, mirroring and celebrating Birmingham’s ever more diverse cultural make up’. On the death of Stephen, his son, Steve, took over the club and moved it to the Hobsmoor pub. When Steve died suddenly in the 1960s, Pat Benson took over as coach, ensuring the future success of the club. In 1967, Pat moved the club to the Harp in Moseley Street and it was around this time that they joined with the Kyrle Hall Boxing Club, becoming the Small Heath Golden Gloves. For a while, the club was run out of Small Heath Leisure Centre, changing its name to the Small Heath Boxing Club. The club temporarily returned to Small Heath Leisure Centre in 1983 after a fire at their Fazeley Street premises. By this time, the club had many successful boxers and Pat was forced to move them out to other clubs so they could continue to compete. It was also around this time that the Chelmsley Wood Boxing Club and St. Francis Boxing Club were established, with ‘a helping hand and sound advice from Pat’. 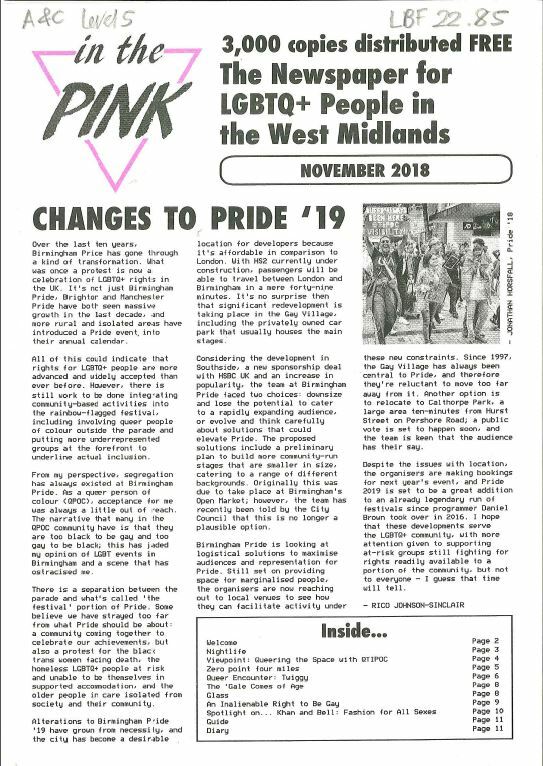 A notable recent addition to the Local Studies Collection pertinent to research of LGBT heritage in Birmingham is the November 2018 edition of In The Pink (LBF 22.85), a newspaper for the West Midlands LGBTQ+ community which flourished between 1986 – 1990. The new edition, an artist project by Sean Burns, contains reproductions of listings from the 1980s such as the Birmingham Club Play List June 1989 alongside new essays on topics such as QPOC (Queer People Of Colour). The newspaper first appeared as the Birmingham Lesbian and Gay Community Centre newsletter for which Archives & Collections retains holdings for the period between May 1978 – November 1986 before changing its name to In The Pink in late 1986. In The Pink was published monthly at the Trade Union Resource Centre in Digbeth and then circulated amongst LGBT entertainment venues and organisations in the West Midlands. The content followed a magazine format containing listings and interviews next to more politically and socially aware features. The newspaper was financed by advertising revenue whilst the November 2018 edition is very much a ‘stand – alone public artwork’ funded with support from a public body. Why, might you ask, has a one – off November 2018 edition of In the Pink been published? Well, in its elemental form, it’s an opportunity to reflect on narratives forming LGBT heritage and consider how this influences and reflects the present. It’s a chance to explore how dialogues may proceed in the future and also highlight how the social context has altered somewhat since the newspaper ceased publication in 1990. This edition provides a platform in which individual community voices can examine attitudes contemporary to the original publication and discuss some of the issues prominent in the LGBTQ+ community now. As the Welcome states – ‘It will provoke reflection on how attitudes have changed since 1986 and on how much work there is left to do’. The diverse range of topics covered in this edition include segregations, nightlife and memories both collective and individual. One of the dominate drives behind this project is to create a more productive and representative platform for LGBTQ+ people. The special edition does not claim to offer a complete history or overview but hopefully will provide a starting point from which to explore the wider LGBTQ+ heritage in the West Midlands. The following is a source list of materials held in the Local Studies Collection relating to a study of LGBT heritage in Birmingham. 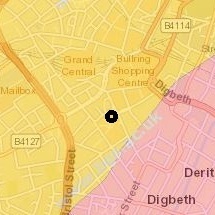 The heart of the eighteenth century Town of Birmingham lay on a north-east to south-west geological fault line, known as the Birmingham fault (see Fig. 1). To the south-east the bedrock consists of the red–brown marl called Mercian mudstone. To the north-west the bedrock was Helsby sandstone. The impermeable marl of the Rea valley led to rapid drainage with consequent violent fluctuations in the run-off to the river. Just beyond the fault line, bands of marl within the sandstone prevented deep seepage of rain water and except during unusually dry periods offered a copious supply from natural springs and shallow wells. Water from these surface springs and shallow wells tended to be clear and soft. The First World War signified a change in the conduct of war. War was now waged on an unprecedented scale against both military forces and civilian populations. The mass mobilisation of military firepower led to untold devastation on the battlefields, campaigns which left millions dead. There are only a handful of surviving records from the psychiatric hospitals in Birmingham dating from the First World War. In the records of All Saints Hospital are reception orders for those admitted to the hospital. These include ‘Service’ patients who were members of the armed forces who had experienced attacks of a psychological kind that had left them with symptoms including those of hallucinations, apathy, loss of memory or understanding, restlessness and the inability to answer simple questions. In some cases, these men already had pre-existing conditions. In 1917 one soldier, whose cause of attack was unknown, was described as ‘… deluded imagining his food is poisoned. He told me that he was surrounded by enemies who wished to take his life.’ [MS 344/15/14]. We don’t know the full details of this soldier’s condition, however the effects of war seem to be obvious. November 2018 marks the centenary of First World War armistice, which brought to an end four years of conflict and the century of the start of the very first parliamentary election campaign in which at least some women participated as voters and candidates. 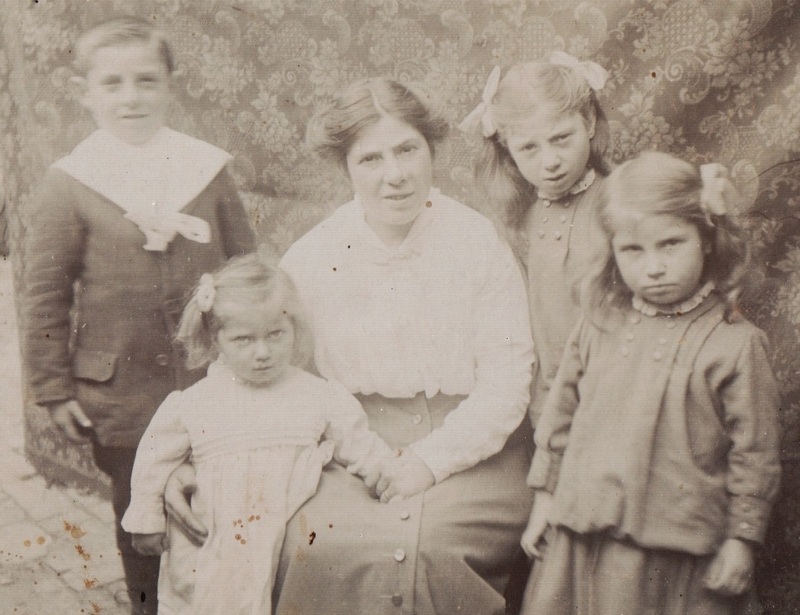 In this year’s lecture, inspired by Chris Upton’s commitment to explore the lives of the ordinary people of the West Midlands, Professor Maggie Andrews will look at how the four years of war and the peace that followed affected the women in the region. 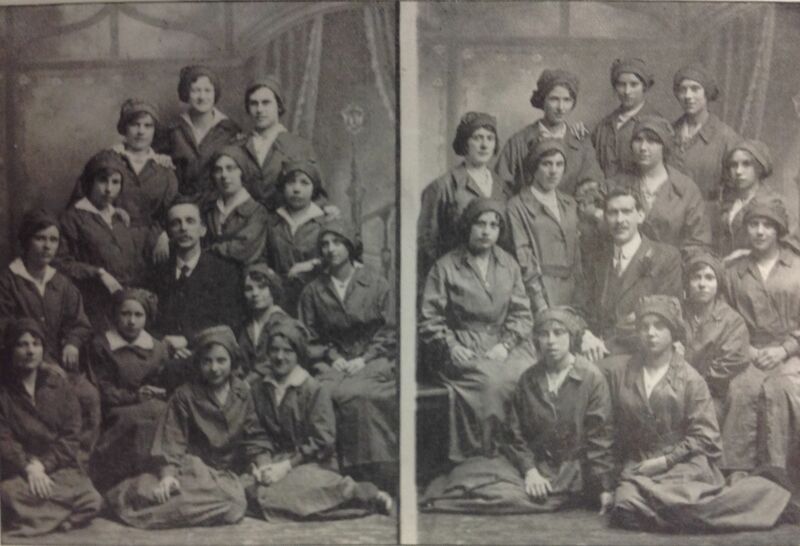 Life on the home front offered some women new working opportunities or public roles and the new women voters created much excitement on polling day in December 1918. 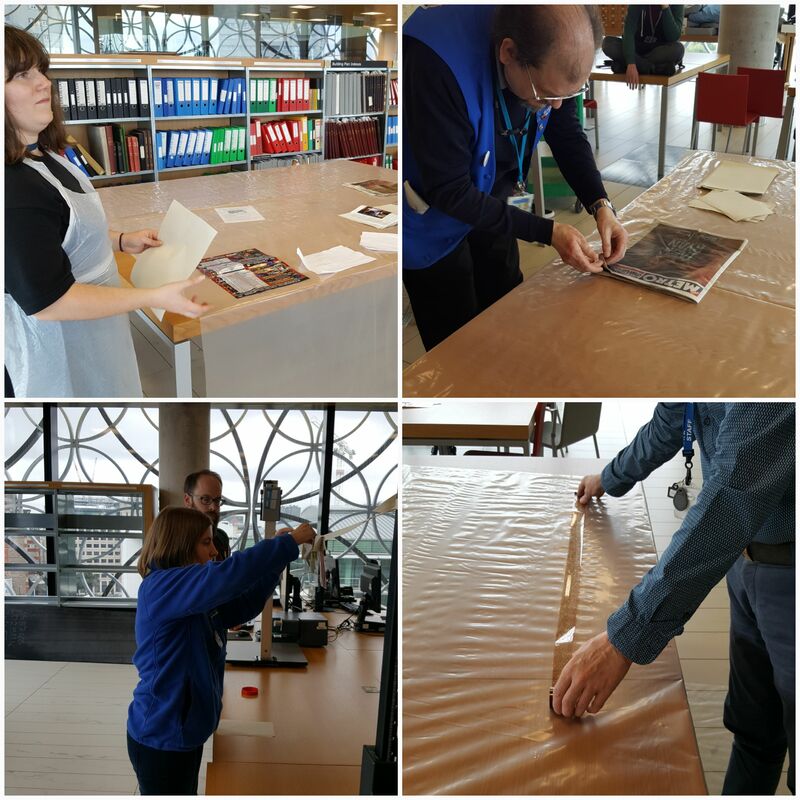 Staff of Archives & Collections practicing salvage techniques to save water damaged items. Having the Wolfson Centre closed meant that staff could attend training on the Disaster Plan. Led by our Conservator, Lucy Angus, the training makes sure that in the case of an emergency, be it fire or flooding in the building or in the stores for example, that staff are aware of the procedures to follow so that minimum losses are incurred. As I’m sure many of you are aware, there have been a number of high-profile disasters in recent years including the collapse of the building housing the archives of Cologne in 2009 and most recently a fire that gutted the National Museum of Brazil. Planning is taken very seriously so that we are prepared to deal with any events that arise and can save as much of the archives as possible, should the unthinkable happen. The training also familiarised staff with where our emergency equipment is stored, which includes hard hats and steel toed boots! 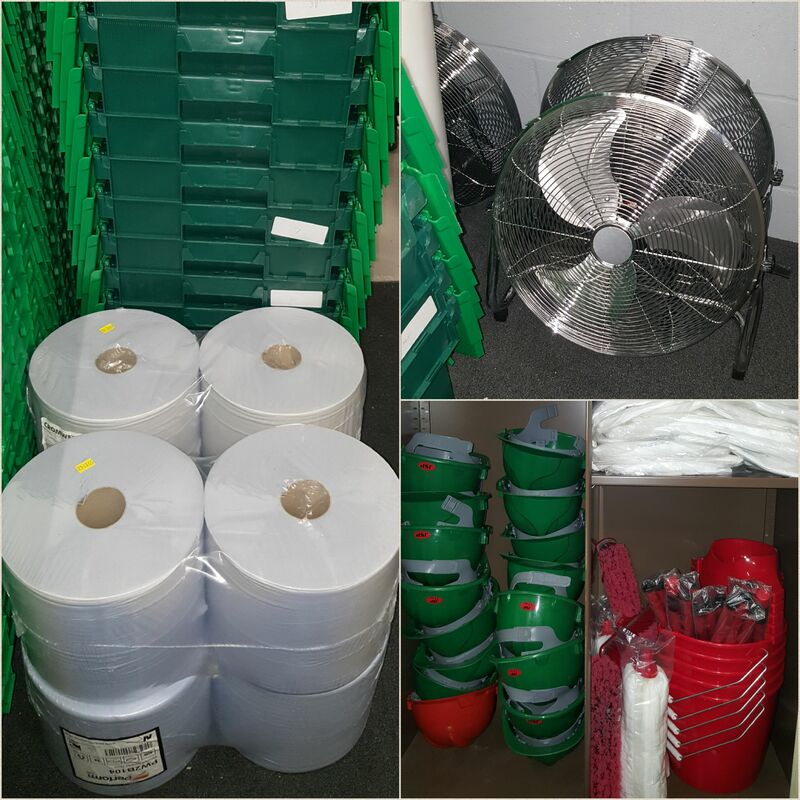 Just some of the disaster and salvage equipment in Archives & Collections. Elsewhere in the stores, following a very large deposit of court records earlier in the year, staff have been arranging these in date order and this will be followed up by listing them in the future. Given the very high number of volumes received, this is quite a task to be keeping us busy! 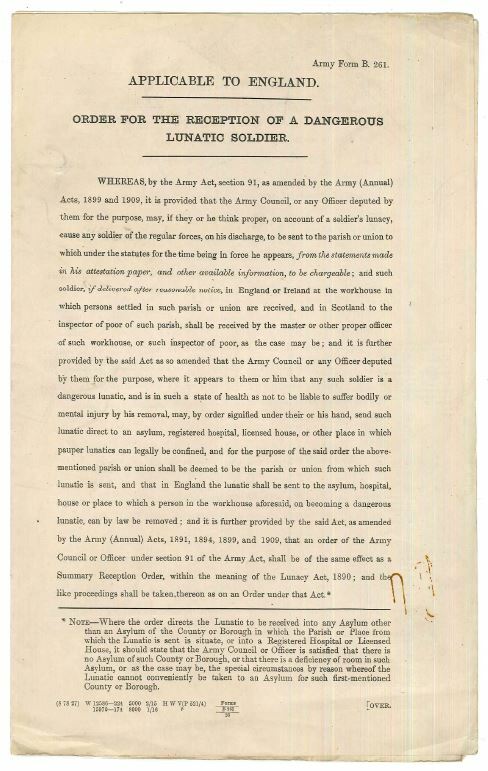 Acc 2014/203 Consent under the Substitution Act 1858. In addition to taking in a new deposit of records from the Birmingham Methodist Circuit on Wednesday, closed week also gives us the opportunity to try to catch up on our accessioning.We still have documents we received back in 2014 which are still waiting to be put in their permanent location within the stores. 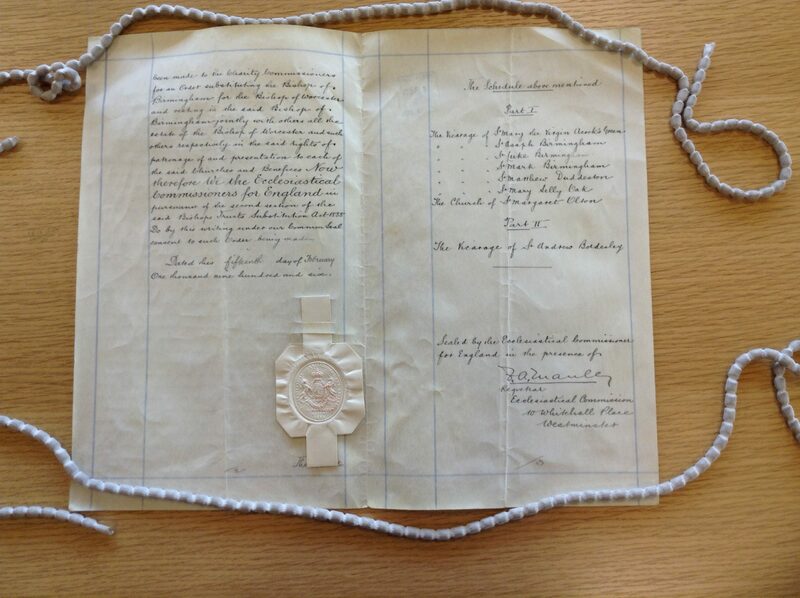 Amongst those waiting to be re-boxed are a collection of documents from the Charity Commissioner which includes a Consent allowing parishes formerly under the jurisdiction of the Bishop of Worcester to be transferred to the Bishop of Birmingham following the creation of the Diocese of Birmingham. 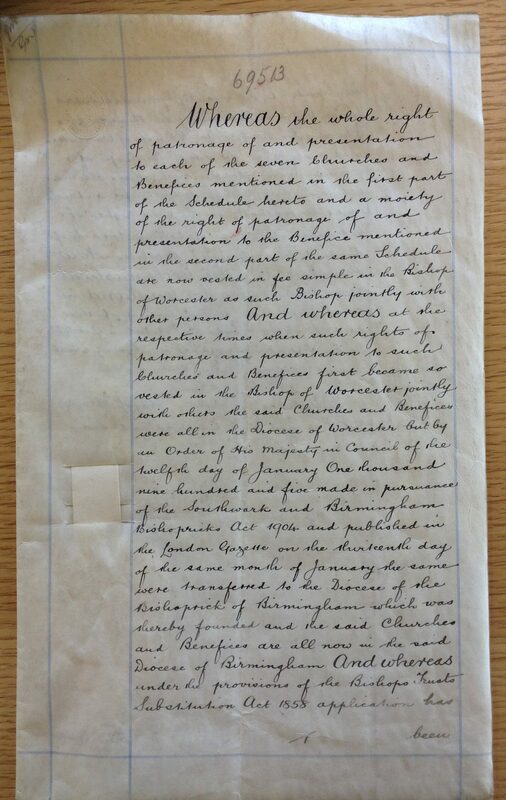 The document is dated 15 February 1906 and what this shows is the transfer of the parishes of St. Mary the Virgin, Acocks Green, St. Asaph, Birmingham, St. Luke, Birmingham, St. Mark, Birmingham, St. Matthew, Duddeston, St. Mary, Selly Oak, St. Margaret, Olton and St. Andrew, Bordesley into the newly created Diocese of Birmingham. Schedule showing the parishes transferred to the new Diocese of Birmingham. There are plenty more tasks waiting for us during our next closed week at Christmas!